What Can We Learn about Writing and Rhetoric from a Makerspace? 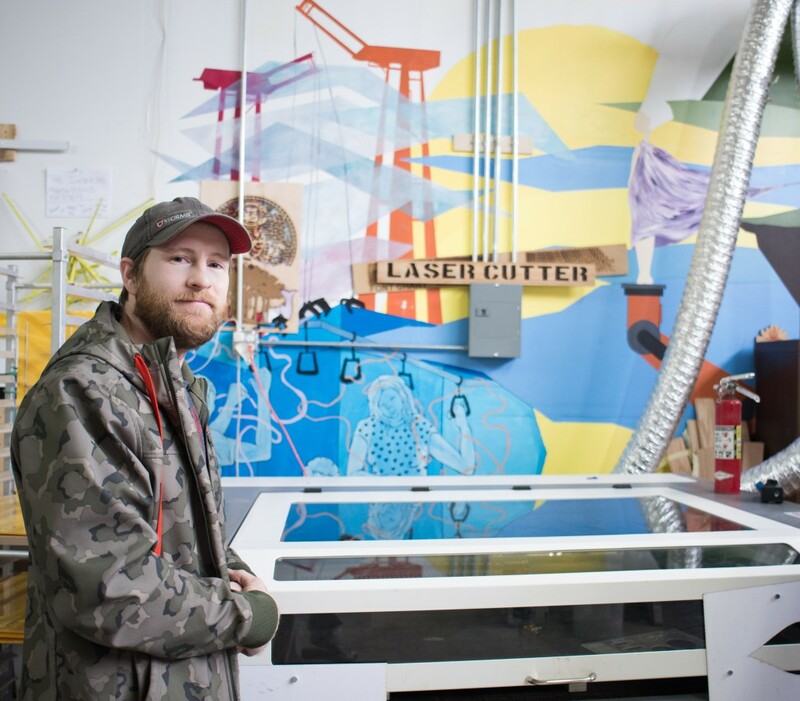 Eric Renn, founder of SoDo MakerSpace. Photo by Daniel McNair. This was the first question that Eric Renn, founder of SoDo MakerSpace (SMS), asked me when I first visited just over a year ago, and it caught me off guard. I’ve been a professional writer for a decade—first in industry, then in academia—but I’ve never thought of myself as a maker. And I had certainly never used the tools and machines I saw, many of them for the first time, in SMS. I was intrigued and determined to learn more about SMS and about the relationship of writing and rhetoric to other forms of making, especially given our field’s interest in materiality and, specifically, in making (Haas, 2007; Powell, 2012; Sheridan, 2010; Sherrill, 2015), tinkering (Craig, 2014; Sayers, 2011), hacking (Ballentine, 2009; Cummings, 2013), and crafting (Prins, 2015). Over the last year, I’ve been collecting ethnographic data for my dissertation, which is a rhetorical case study of making practices in SMS. * I’ve watched SMS, which had only been officially open a few months when I first visited, grow and evolve. I’ve learned the stories of the makers, machines, and projects in SMS, and I’ve experienced the exhilaration of “going from idea to object”—as Eric describes the process of iteration—using technologies I’d never imagined I’d use, like a laser cutter or a 3D printer. And these experiences have changed the way I think about writing and rhetoric. For example, practices of rapid prototyping I’ve observed and discussed with makerspace participants have given me useful ways to approach writing about my research in my dissertation. 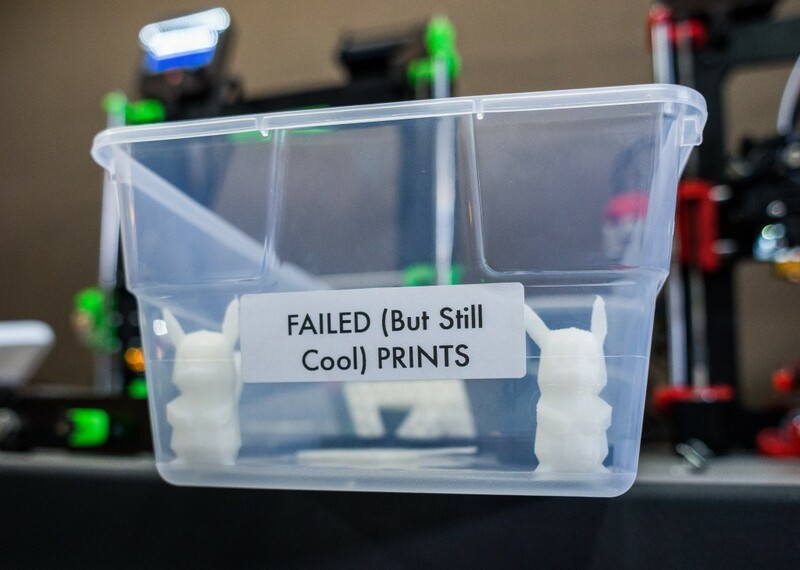 I’ve learned that failures can be useful, necessary, and even cool. Photo by Daniel McNair. I have also seen my own thinking about the relationship of writing and rhetoric to other forms of making change. When I began this dissertation project, I was thinking about how makerspaces might inform or even transform how we teach and study writing and rhetoric. 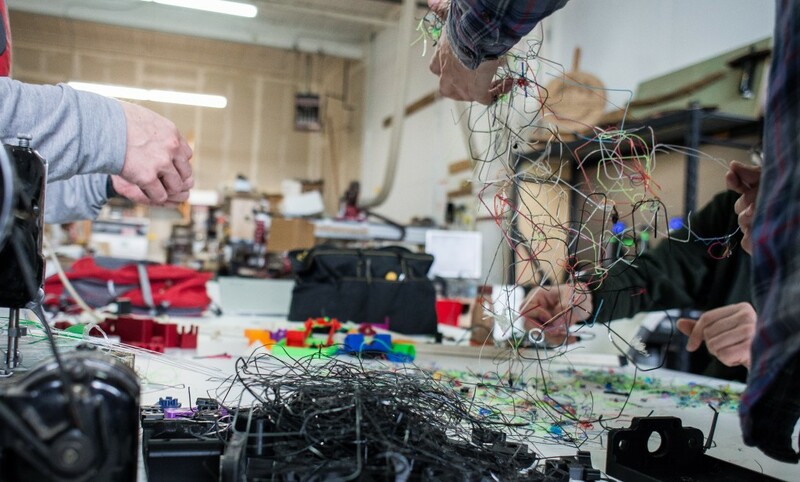 I wondered how studying the making and transfer of knowledge across 3D fabrication tools in a highly collaborative, creative space might help us better theorize and teach rhetorical dexterity as students compose across media, genres, and languages. I wondered how teaching 3D printing alongside alphabetic writing might help students transfer rhetorical skills across modalities and media. At the same time, as I have talked about my project with colleagues and mentors, I’ve been asked many times how and why studying a makerspace is relevant to composition. These were the initial questions with which I approached my dissertation research, and my work toward answering these questions has led me to more questions. These new questions—which I’m sharing below—are the questions that I am considering now as I’m writing the data chapters of my dissertation and thinking about what I’ve learned in the makerspace. A 3D printed spatial manipulation toy. Video and gif by Ann Shivers-McNair. How can we better study the entanglement of writing with other forms of making? How can we study the entangled and differential processes by which things like “human” and “maker” and “rhetoric” come to matter? What sites, in addition to makerspaces (which represent only certain kinds of making), can help us seek out and study that entanglement? (Literally entangled) 3D printer filament waste being sorted for recycling. Photo by Daniel McNair. Inclusivity and Access. One thing I’ve been struck by, in my conversations with people in SMS and in my research on conversations in the maker movement, is the tension between goals to democratize access to fabrication technologies and the reality that SMS, like the maker movement, tends to skew male and white (Maker Media’s own research on maker faire participants confirms this). Eric and his colleagues at SMS are aware of this issue and have expressed from the beginning a commitment to making the space inclusive for women and people of color. What and who matter, and what and who are excluded from mattering by the environments created around technologies of making? If increasing access to technologies of making is our goal, then how can we achieve the critical and transformative levels of access—beyond simply providing material access—that Adam Banks (2006) argued is necessary? These are some of questions I’m pondering, and I hope to hear from you—in the comments here, and in future conversations—your thoughts on these questions and what questions you’re considering. *My study was reviewed and exempted by my institution’s Human Subjects Division. Alexander, J., & Rhodes, J. (2014). On multimodality: New media in composition studies. Urbana, IL: National Council of Teachers of English/Conference on College Composition and Communication. Ballentine, B. D. (2009, Fall). Hacker ethics & Firefox extensions: Writing and teaching the ‘grey’ areas of web 2.0. Computers and Composition Online. Banks, A. (2006). Race, rhetoric, and technology : Searching for higher ground. Mahwah, NJ: Lawrence Erlbaum. Cummings, R. E. (2009). Lazy virtues: Teaching writing in the age of Wikipedia. Nashville, TN: Vanderbilt University Press. Haas, A. (2007). Wampum as Hypertext: An American Indian Intellectual Tradition of Multimedia Theory and Practice. Studies in American Indian Literatures 19(4): 77-100. Maker Media. (2015). Fact sheet. Retrieved from http://makermedia.com/press/fact-sheet/. Powell, M. (2012). 2012 CCCC Chair’s Address: Stories Take Place–A Performance in One Act. College Composition and Communication, 64(2), 383-406. Prins, K. (2015). Materiality, craft, identity, and embodiment: Reworking digital writing pedagogy. Retrieved from ProQuest Dissertations and Theses. Sayers, J. (2011). Tinker-centric pedagogy in literature and language classrooms. In L. McGrath (Ed. ), Collaborative approaches to the digital in English studies. Logan: Utah State University Press/Computers and Composition Digital Press. Sherrill, J. (2014). Makers: Technical communication in post-industrial participatory communities. Unpublished thesis. Purdue University. Sheridan, D. (2010). Fabricating consent: Three-dimensional objects as rhetorical compositions. Computers and Composition, 27, 249-265. Ann Shivers-McNair is a PhD candidate in language and rhetoric at the University of Washington, where she teaches writing and rhetoric courses. Her work has appeared or is forthcoming in journals and edited collections such as College Composition and Communication and Crossing Divides: Exploring Translingual Writing Pedagogies and Programs. My mother engages in the typically-female “making” we call “crochet.” My whole life I have watched her make odd little un-nameable experimental “things” just to see what they would look/feel like. Some of them she unravels and some of them she keeps — because they are “cool failures.” As with all practices consider “typically male” or “typically female” there’s a tendency to consider the things males think are cool “objectively cool” and the things that females think are cool “crazy cat lady s#!t.” But what my mother does with crochet experiments is also a kind of “failing fast,” and the things she creates are often very neat, and very useful. The difference between making out of yarn and making out of melted plastic is the difference between a crochet hook (79 cents) and all the maker equipment (lots more than 79 cents). There are some real artists who sell very unexpected crocheted objects on etsy. You should check them out.